According to opposition sources, the individuals and families targeted for mass-killing on May 25/26 were selected more or less at random, for supposedly supporting the rebellion, and in some views simply for being Sunni Muslims. 3.2.1 The People’s Assembly Speaker? The generally-agreed death toll was set early at 108 people killed. But as the Syrian government pointed out, that was inflated by the inclusion of rebel fighters/terrorists killed in the operation. This seems to be true, but listings varied, some lists reaching 108 in different ways, missing some names with others appearing instead. This list still contains 112 apparent civilian entries including, as the title suggests, 64 children (to the usual 49). Two adults are quite possibly phantom entries, but the rest are likely to contain few errors: therefore 110 civilian massacre victims, or perhaps a few less than that, seems the best estimate. - Mustafa Hassan Abdul Razak and his wife and children's (8), and the wife of one of his children. Notes: The numbers in parentheses seem to refer only to children? (End part "البالغ عددهم" Google translates as apostrophe s - 's - possessive. All that for that? Split, it says "of" and "number") Entry 2, the part "my wife" keeps translating that way-not clear who the "me" is. Not listed-Imad al-Sayed, for example. His brother Aref had nine kids? And also a belated and valuable find: Center for Documentation of Violations in Syria, many names in Roman letters, says for example an adult Ali Adel Al-Sayed was killed (per little Ali?) and rebels Talal Bakour and Haitham Al-Hallaq were killed on the massacre day by shooting (more coming from this). See this SCDV martyr's list for 94 killed May 25 in Houla , a stray 3 listed Hula. File:Houla Victims 2014 List.pdf DCHRS bad translation compared to a slightly different list in Arabic, with adequate new transliterations, and 113 entries total after collapsing all matches. File:Houla Victims 64 Children List.pdf The big correlated list: the first two lists above plus VDC entries, all correlated into 112 civilian entries, including 64 children. It seems there were two crime scenes from the relatively limited massacre against the Al-Sayed (alt. Sayyid, Alsayed, etc.) families, both on the east side of south Main Street. Actually, "families" might be more accurate; those killed at each site seem not to be directly related, despite the same name. But there are more than two Al-Sayed names and households involved, and more accusations and confusion. This family was of Sunni faith, according to all sources. Their political affiliations, are, however in dispute. One side has living alleged witnesses, the other side does not. (newer addition, considering the below info plus more) From the above list, three al-Sayed families were hit. The Syrian Arab News Agency (SANA) named two on June 2, reporting that many of "the victims belong to the family of al-Sayed, with Muawiya al-Sayed being a police officer who didn't defect and was always in danger, along with two other al-Sayed households who are related to Meshleb al-Sayed." who was active in politics (not rebel-affiliated, see below)  The latter is alternately called Abdalmuti Mashlab, so possibly of the full name Abdalmuti Meshlab Al-Sayed. Mr. Al-Sayed was not home at the time and survived, by some sources losing his own wife and three children, although this might be confused (see below). His family is never acknowledged in opposition sources, who have found ways to distance Meshlab from the stricken families (details forthcoming), so this remains a point of contention. Muawiya al-Sayed, a police officer or alternately (and less reliably) "a senior official" given as Mouawyya al-Sayyed  was reportedly killed along with his family, a wife and apparently at least two children, one a grown man and an Army soldier (details may conflict, forthcoming). The name Muawiya is considered extremely Sunni, referring to ancient rivalries, and considered offensive to Shi'ites. It's been speculated by opposition sources this is part of why his family was targeted by the Alawite (Shi'ite) militias. Earlier yet, on May 26, a different family was mentioned by SANA and related sources: Aref Mohammad al-Sayyid was killed, along with "his two brothers Imad and Ouqba, his wife Izdihar Ali al-Daher and three children." An alleged witness for an attack by opposition forces was quoted by the Syrian Arab News Agency supporting the existence of an "Okba" of that family, killed. "the group led by one Haitham al-Housa hated al-Sayed family ... this group didn't even fire at the detachment but rather at the house where Okba al-Sayed, his brother, his sister-in-law and their children were, killing them." This is possibly the same family later described as related to Meshlab Al-Sayed; it includes members from two related families/households (or three, as three brothers were killed), a wife and three children among them. Aref's family is apparently the one seen on SANA video, UN monitors, and others, in situ, on May 26. Collectively, seven members are shown (two kids shot in the head in a big sleeping area, a little girl in the hall nearby, a bloodied woman on a bed, and three men executed in the recessed walkway outside). It's all in an identifiable home on Main Street, given by UN sources as one of the Al-Sayed crime scenes (confirmed). The Aref Al-Sayed household also, by balance of similarities, sounds like the family young Ali Al-Sayed says he alone survived from; his father and mother were killed, three younger siblings Nader (6), Rasha (5) Aden (8). Further, the same house shown by SANA, the UN, and others, is the one re-visited by Ali and some activists on video in September. However, that boy survivor, more fully Ali Adel/Adil Al-Sayed, gives his killed father as Ali (or Ali Adel) Al-Sayed, sometimes  and elsewhere as either Aref or Shawki: "They said they wanted Aref and Shawki, my father and my brother... then they found Aref, my oldest brother"  In Ali's version, one of the three dead men outside is not his dad's brother but his own older brother, named Shaoqi or Aref, depending. The killed uncle is named Oqba or Aref, depending, and another uncle named Abu Haidar is mentioned. The one known witness list (from the Damascus Center for Human Rights Study), comprehended with Google translate, does not clearly contain any names Al-Sayed (السيد). There is a similar السويعي (Alsoiei) for entries 22-25, with no matching first names. The family name Arif or Aref (عارف), included with a "Mr." does appear. Mr/Aref is of course the head of household cited by SANA, and is the first name of Ali's father/uncle/brother, depending, and appears for entries 30, 31, 48, and 93. Family matches include Nader (#30) and Rasha (#48), a younger brother and sister cited by Ali. (the other two Arifs given as dying are Mohammed and Adel)  With two or three households attacked, there should be more than four members of this family killed - we've seen seven of them on video in just one of the two homes. The other Al-Sayed household, Muawiya's, also seems to appear in cloaked form on the DCHRS list. Perhaps du to his offensive first name, his clan gets the name "Mr. Sid" (as translated), or roughly "Sayed." The names listed under that are "Mr. Sid" himself, "Mr. Sid Ahmed," and Mr. Sid Sara, child. That’s all, just like Hana and Maryam said; Muawiya's alleged wife and alleged daughter, along with unspecified and un-numbered other relatives, managed to flee, they said, leaving behind the father, the injured soldier son (Ahmed?) with a broken leg, and little 8-year-old Sara, because they forgot to wake her up to come along. It's said by a local in Taldou, where Al-Mashlab/Sayed's family lived, that Al-Mashlab/Sayed "was elected on May 24th, and the next day they killed his wife and three kids and his brother and his big family as well." Having lots of work to do, the new speaker would remain in Damascus, with his family at home in Taldou, where they were allegedly massacred late on first full day on the job. However, SANA said only that two household related to Meshalb were targeted; the wife and three children we know of were Aref's, and his brothers (if not their families), joined him in death (she might have thought Muawiya was a brother). But even if not his own wife and children, if the relation was close enough, this could well have been a painful or terrifying blow to the new speaker, and that may not be a coincidence. Especially considering the timing of it, the rebel message would be clear; essentially "we do not support the new reform parliament one bit." Ali Al-Sayed, speaking to Der Spiegel for his alleged family, has renounced any relation close enough to Meshlab to really matter (citation details forthcoming). The Syrian government says the massacre was the work of hundreds of foreign-born terrorists stationed in a nearby town. It says these militants were out to punish one family that had a relative in the Syrian parliament, but Maryam Sayid, who survived the massacre of that family by running away, said the government's version is simply untrue. Like the Al-Sayed family, they were clearly targeted for some reason, and not hit randomly. Accounts vary as to the family's religion - Sunni, or Sunni recently converted to Shi'ism. See Abdel Razaq family: Sunni or Shi'ite? The distinction is highly important in the increasingly sectarian conflict so vividly illustrated in the reported Houla massacre. There is one other alleged class of victims of perhaps great importance, but shrouded by confusion. A supposed "Shomaliya family" comprised of Alawites was also killed in the massacre, but details never really developed to bear that out. This might, however refer to a genuine class of Alawite victims of the Houla massacre, whoever's doing it was, that was somehow obscured into oblivion thus far. To sort that out, see the new page Houla Victims: Shumariyeh/Shomaliya. Rainer Hermann was told that "also killed were members of the Alawi family Shomaliya." However, numerous other sources suggest it was instead two Alawite families in the small village of Al-Shumeriya that were killed during the attack (by the morning of May 26), totaling ten victims. As SANA then reported "the terrorists brutally killed Mohammad Abdul-Nabi Abdullah, his wife and six sons in addition to the citizen Rateb al-Oulo along with his son." Further details, a possible location, and other interesting clues are at the above link. Several members (8) of the Al-Kurdi family were reportedly among the dead. Some names consistent with this appear on the DCHRS victims list and on a SCDV list for deaths in Aqrab, Hama. (sources compared below, the latter primarily). Even those six killed in Aqrab, just north of al-Houla, are listed as "Houla massacre when the town was shelled and then parts of it were stormed by the regime's thugs (shabiha) and entire families were killed," at the south edge of the southernmost town of Houla, where rebel fighters from Aqrab are mentioned taking part. Best guess: they hit these people, for whatever reason, earlier in the day before cruising south - killing two more Kurdis among all the other people. Mahmoud Al-Kurdi, Adult - Male. Killed in: Hama, Aqraba, by Field Execution (like the others below). "Notes: The father." Further, two adult female members, apparently, were field-executed in Houla: Khloud Hussien Al-Kurdi and Haloum Khalid Al-Kurdi. These also appear on the DCHRS list. A Family Abbara is given, by some non-rebel sources, as owning a house near the clock tower roundabout in the north (center) of town. Akram/Akrama Bakour, of the Free Syrian Army, cited as "also killed in the massacre" one "Mohammad Abbara" along with "his daughter Amina and her family of seven." This Amina and her kids will be under another name, unsure. No "Amina" appears in our opposition lists. The Abbara family lost only two adult men, per this SCDV list for all victims Abbara. Those two died in "shelling," it says. However, the DCHRS list puts them among the killed rebel fighters, "lead the army." SCDV's "Ammar Abduljawad Abbara" = DCHRS "Ammar Abdel Gawad, a" SCDV: "Mohammad Shafiq Abbara (age 27)" = "Mohammed Shafiq phrase"
Prior deaths in the family, very interesting. They have died in Homs, (Karm al-Zeitoun and Khalidiya), and especially Hawleh/Houla, more than anywhere else in Syria. Some as fighters: Oussama Issam and Abdullah Kamal from Houla FSA were both killed by the army on June 1, for example. And Alaa Farouk Abara on March 28. Civilians: First one listed, Mohammad Abdulmajed Abbara, killed May 27, 2011 by shooting in "Karm al-Zeitoun : Nazehen." Early August Jihad Abbara tortured to death, Sulaiman with 7 kids shot August 12. Anwar Essam and Suleiman tortured to death Dec. 24, 2011. Horrible videos for each. Ammar Iyad Abbara, 13, shot in Houla Feb. 7 2012. An Alaa Abdulhakeem Abbara, shot during storming of Houla, March 10, 2012. Harmoush: SCDV has Fadiya Ashraf Harmoush, Adult - Female and Fadia Abdul Hameed Harmosh, Adult - Female as Houla massacre martyrs. So does DCHRS. Per wikimapia labels, a Harmoush family (House Ali Harmouch. Abu Saif religion - بيت علي هرموش . ابو سيف دين ) lived at the corner building one of Abu Usama al-Houla's videos was filmed from - rebels were firing off the roof. Zegahi/Zikahi: The rebel defector told Marat Musin (ANNA News) the units he was with "opened fire on the building of the military intelligence. The bullets hit the building, but also neighboring houses. One of the armed rebels fired from a bazooka, but missed the target. He has hit the house next door, killing two members of the family Al-Zegahi, which, as it is said, just have been sitting down and peacefully drunk tea." Ahmed Al-Sayed, an active SAA soldier on leave with a broken leg, was killed at home with his father a retired police colonel, and an 8-year-old sister, at least. ANNA News posted a 10-minute video with a scene of six dead soldiers in a morgue (composite view at right) It's not clear at the moment if these are supposed to be battle dead of the 25th, but Dr. al-Jaafari gave the UN a massacre death toll of 114 – apparently the 108 civilians plus six defenders. The real number could be considerably higher, and they toned it down as they sometimes do. (basic intro text): The first reports from rebel/opposition sources was that the Houla massacre was the work of government shelling. Much has been made of this initial story not matching up to the state of the clearly executed bulk of the dead. But the lag was small enough it could almost be natural delay when, over the next couple of days, more and more acknowledgements surfaced that in-home slaughter of whole families happened. Men were dragged outside and executed, women were raped, children executed, people forced to watch. Relatively little physical torture is reported - they seem to have been rushed. (some citations forthcoming). Once the incendiary vision settled of, specifically, regime thugs slitting childrens' throats, the government was there to point out how that's more like a thing the Islamist terrorists who attacked Taldou would do, not anything they would do. This was a good counter-point, but somehow the mainstream media view muted the point it was based on. (the following is in reference to, and explained in, this article) Western officials, a BBC editor, and prominent media critique outfit Media Lens, collectively, cast that precise image, and implicitly those similar to it, as "fabrications" of an over-eager media bent on demonizing the government's soldiers. They had in fact only shot the children with guns, point-blank. But in general, the children do seem to have been killed in ways other than sliced jugular veins. But some images around (some at least potentially misattributed) and a number of videos show how little it means that children didn't have their throats slit, at least, not very many did. Consider some the horrifying videos in this playlist of 86 Houla and Taldou videos. The best photo/video still compilation is in two parts at an anti-Assad Lebanese discussion site (warning, graphic, and tragic, of course). Many, many, dead children, cause of death generally unclear, but almost all are coated in blood, some have hands bound in front with crude, blue plastic ties. Some look asleep, looks of anguish frozen on the faces of some and some have parts of the face missing. One five-year-old boy shown there might have his throat sliced open, but it looks more like it was torn out, to the spine, with a claw hammer or some such. Skulls are bashed and sliced open from the top, back, and forehead, even on some of the smallest babies. At least two victims have ambiguous but severe, gaping injuries to the chin/lower face more consistent with a sternly-swung hammer, or some rather peculiar shelling, than with a sword-wielding Islamist. Many, a majority, do however appear simply shot or just unclear. On adults at least, some eyes are gouged out. At least one little boy and one little girl have their guts coming out somewhat, as if crushed (boy) and/or torn-up by an explosion (girl). These look a bit more like shelling deaths, but all else considered, some type of execution can't be ruled out even in their cases. Some of the most horrible violence, especially done to children, is genuine - torn-off jaws and hacked skulls at least happened to kids that day. But some of that worst of the worst was added with recycled images. KaZ Victims: One room full of men, women, and mangled children turns out to have been already aired after the March 11, 2012 Karm al-Zaytoun Massacre in Homs city. These extra-gruesome images have been used by both sides to blame each other for the Houla Massacre, and wrongly so. A girl with her eye shot out/brain protruding, in a pink coat, is the most famous victims. If she's in the spread, it's from this massacre, with fascinating research backing it - see the link. Video of the martyr video 1 (unavailable) - video 2 (private) - from elsewhere, another video (unavailable) - another yet at Daily Motion is still viewable, and could be the same child with shirt still on - dated May 17. It looks like his throat has been massively torn out with a claw hammer, and he lived long enough to stuff his hands in the wound and get that dismayed look on his face. That's some shelling. This image is what Alex Thomson must mean when he says a local man showed him video on his cell phone, “of two children, their throats slit so deeply they are virtually decapitated.” There are two famous photos of Khaled, looking almost like two different children. This local should know the video is from a week before the alleged Shabiha assault. As seen here, there's also a photo where he's rolled over - he's got a serious wound in the side and middle of the back (both bullet exit wounds? ), plus little nicks all over from exploding fragments, maybe, and then the throat elimination. These moving images have been re-used many times since for subsequent Syria massacres, and according to this Urdu site (Dailymotion video source), even used to blame Shia killers in Pakistan, in November 2013. Other footage and pictures posted on the day of the killings showed a child with its throat slit, with what appear to be burn marks near what may be an entrance wound on the upper rib cage. That sounds like Khaled al-fares. A Houla kid, but killed a week earlier and not to worry, by "shelling," not Shabiha." Another showed a girl, apparently shot in the right eye, blood soaking the right side of her clothing. There's a similar-looking girl in Houla, but covered - the blood down the right side clarifies he's talking about the famous pink-coat girl from the Karm al-Zaytoun scene. Oddly enough, the report citing that photo for the wrong event was titled "Families herded "like sheep" to die in Houla massacre." - when rebels are heard calling the KaZ victims "sheep" on one video, and its said they were herded to one apartment in batches to be slaughtered. Mohammed Family recycled: The "Examiner" includes in an emotive slideshow a particularly horrible (graphic!) 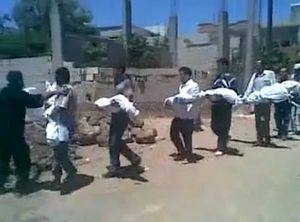 scene, captioned: "A family, all victims of the Houla massacre. In the video on youtube, you can hear the cameraman from the Free Syria army break into tears (courtesy of Days of Syrian Rage Facebook English Facebook page unless noted)" Actually, that's from from a mini-massacre in the dark days of Homs, January 30, 2012. As with the above, slightly later horrible massacre, this was in the Karm al-Zaytoun district, they say say. Father, mother, four young children, mutilated, apparently tortured before death. All the massacre vicrtims, if not all the day's battle dead, were seemingly gathered by opposition fighters and activists at their Ali Bin Al Hussein mosque in the north of Taldou. On the night of May 25 the children especially were widely filmed and photographed, in at least two locations there. Some were in a large, red-carpeted room, laid out nicely on blankets and wrapped in yet more. The most famous display was of unwrapped dead children, seventeen of them, with their often brutal injuries plain to see. There is the widely shown, dark, low resolution version of this, as well as a more horrible, less famous version with better lighting and clarity, and the same amount of shocking close-ups. Others were seen laid out more helter-skelter on a white marble floor, first shown clothed, bloodied, some still bound at the hands. (Same room, prayer mats removed when more bodies are brought in.) Some more pictures were taken after the children had been stripped down to their underwear, and presumably (according to Islamic rites) they were then stripped fully, washed, blessed, and wrapped in fresh linens. Once wrapped head to toe in white, the bodies, quite possibly a full roster of 108 from the available images, were laid out again on the 26th. During the day of May 26th buried in their mass grave at their opposition square near there. But UN monitors only counted 92 of the 108 on the 26th (citation needed) and we can be sure some bodies were still in situ on Main Street the following day, as seen by SANA and the monitors. So the question of who was removed from the massacre sites and when, and what that means, is of some interest. So we turn to what happened just after these people were killed in their homes. The various Abdulrazaq households were the bulk of the dead, as reported - around 62 out of 108, along with a few members of other families tallied at 68 dead, according to FSA fighter "Akrama Bakour." To have as many dead kids as gratuitously shown there by the opposition, these probably all had to have been removed from their homes at the south end of Saad Road, and trucked north. The road down was reportedly cleared by the distraction attack on the Army post at the roundabout in the early afternoon, and the way back would be opened by the more decisive conquest of that post that came after 5 pm. (see Houla:Timeline. These bodies, the majority, were not known about directly or mentioned by SANA or the Syrian government in their first reports. They focused only on what their own cameras could see, presumably moving in with the army as it regained control. 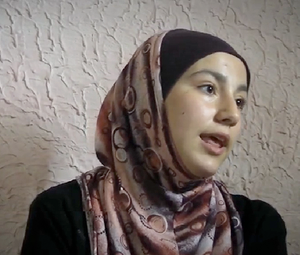 SANA's video showed the victims where they lay, how they were killed. In rebel/opposition videos, the slain Abdul Razaqs (judging by the large numbers present) are shown in in their homes, but mostly after being lined up and covered with blankets. It's not a crime scene investigation, just a respectful removal documented halfway through. For whatever reason, they were on virtual camera silence prior to that, and the number of videos prior to the mosque are rather scant. The various Youtube videos known to us show bodies laid out in at least three sites, likely four or five, which we shall refer to by the number of bodies. They look like emptied rooms in domestic homes, not professional setting like a morgue, although sometimes the sites are described that way. Either way, these are the body displays prior to those we can recognize as the mosque. 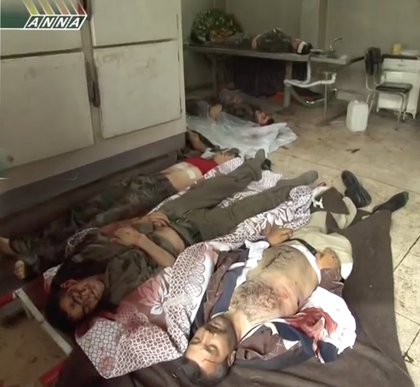 One video from alhoula samer shows at least seven bodies laid on a hard, speckled, kitchen-type floor. Wrapped, and covered in bags and blocks of ice, they offer few clues. Only one victims is uncovered and shown up-close, and that right at the beginning; an infant with a an apparent bullet hole in the forehead and the back of her head blasted apart (seen in more detail in agraphic rebel photo from the mosque). Noteworthy here is the presence of natural daylight, it seems, in a video dated 5-25. This shows rebels had access to this crime scene and had bodies wrapped for removal before dark (possibly as late as early dusk, about 8:45 PM) Some red carpet to the right and something wrapped there makes possible a tie in with the next scene, which shows more bodies in a night scene with artificial light - the gathering over time underscores the other video being pre-dark rather than post-dawn the 26th and dated wrong. If this Facebook photo is labeled right (decent chance) the infant shown is Safaa Ayman Abdulrazaq, the youngest daughter of alleged survivor Hassan Abdel-Razzaq aka Ayman aka Abu Firas. In that context, the number of bodies becomes interesting. All records accounts but two say he survived but lost a wife and five children - Safaa, Abdullah, Fallak, Firas, and Ghias. That would be six bodies. The remaining two accounts: Major Jihad Raslan says "Abu Firas" (the same man by deduction) was "literally slaughtered." That would explain the 7 bodies. Akrama Bakour told the BBC the man he (and most records) calls Ayman survived but lost a wife and six children. That too might explain the video, except that he only had five kids. "Hassan" is probably an impostor, as other clues suggest anyway. Since this is only 7 bodies at least, with perhaps 8 or 9 visible and others off-frame for all we know in both videos, it could be Safaa's inclusion with 6-7 other bodies - especially within a larger collection is a total coincidence. However if so, the video's title steepens it: الحولة خمس نساء و طفلة من ضحايا المجزرة 25-5-2012 - Hula five women and child victims of massacre. Presuming five is more likely a counting error than his getting the gender and ages wrong, he means six women and child victims, and a 7th body ... Ayman, or some adult male. And keeping them lumped by family just make sense and is the most likely way they would group them. This video comes close to proving that crucial alleged witness is not who he claims to be. About 16 victims are seen here, in a small, carpeted but emptied room. One video has better resolution and an activist preaching the moral lessons of these dead. At 0:31 we can see the other floor, a bucket, and ice, for the possible tie-in. Some of the victims here seem to have ice on them, but in spots only. In this main room, the adults - at least six, all seemingly men, are lined up along a far wall (with distinctive stains along the base, and the children at their feet (ten bodies, with one or two apparent women included). Another view has better lighting but worse resolution and a strange crawling effect. Nonetheless, at least the boy on the far right is recognizable from the mosque (photo), and on the far left, the man wearing the "Don't Stop the Rock" shirt and the north Saad victims. The other three are faintly discernable in that upper row in positions 1,2 3 and 5. In Another arrangement of the same bodies in a third video from that room, with English subtitles, lacks two of those victims, and has perhaps additional bodies in their spots, so the overall tally here becomes a little unclear. This one seems to peek under the blankets more, showing more youthful faces frozen in terror, and it seems from this there are at least three women here. Another scene, perhaps the most horrible of them, definitely includes some bodies from others, representing a move to a morgue prior to the mosque. Hard floor, molding, and rolling chair (1 :20) make it look like a morgue or such, but all else says it could be a re-purposed home as well. 18+ The After Math of Houla Massacre, committed by Assad's Gang ( English Sub) The main room shown seems to contain eight bodies: two women, two men, a boy, disabled boy, the baby, one unsure. The disabled boy shown at the beginning has an earpiece and is recognizable in a later photo from the mosque's marble floor. The baby seen among seven bodies on ice is here and shown again, matched by head injuries, bullet hole, and red sweater. She or he is being flopped around like a rag doll in a disturbing way, the camera and light all but shoved into the child's open skull. One man seen at 1 :02 might wear Army fatigue shirt, bound behind, bandaged head, executed after recieving medical treatment. The next room has seven bodies, most or all of them adult women. One has left eye blown out, and a scream frozen on her face. Select narrator quotes: "Look o Hammad, O Annan… even women were not spared … a toddler! A one-year-old toddler !" "Women, women, o where are you Annan, where is the Arab League ?" The other scene shows more bodies yet in a different room of about the same size - there are at least 20 bodies here, maybe over 25, enough that it can only be the the hardest-hit of the homes. "Akrama Bakour, Free Syrian Army" told the BBC "Abdul Rahman Abdul Razaq lost his wife, his five daughters and 11 grandchildren as well as his six daughters-in-law and four of his sons. He still has two who are still alive; one is called Firas and the other Rateb. This massacre was of 27 people in the same room." The final number here, then, is likely 27. After the sheets are pulled back, the camera can see, dimly in the insufficient light, at least eight little heads in a row, reading right-to-left, then a baby, and four apparent women. The second row at their feet seems to feature one covered boy, a middle aged man, and an unclear number of others. At least five or so lay off at their feet in a side-room. Again one view is not as good as the other. Again, no more than the two views of this scene are known. The second one, with a few frames stitched together and enhanced below, shows a little detail on the children. The girl in unique clothing in the center is clearly recognizable at the mosque (photo). There was one other scene, with only ten seen bodies and an apparently different array of children. Like the others, these too are shown only after being lined up on blankets, not in pools of their own blood. Unlike the others, the only public images are stills, not video. There are videos of the scene, but they're made from the still images (one example). Here are seen five apparent adults, totally covered, and children, uncovered and badly abused, ranging in age from about five to 12 years old. The low number makes it less than clear these are from any of the Abdul Razaq families, although they might be. There are too many children to be the Mauwiya Al-Sayed home. 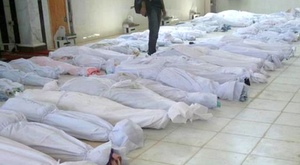 In fact, the total number here, ten corpses, is the same for the reported death toll at Al-Shumeriyeh. If all members of the two reported families were collected in one of the two homes, and two of the children were old enough to be wrapped with the three parents, this could be imagery of the alleged Alawite victims of the Houla massacre. The smaller number of Al-Sayeds are a different story. One home only - Aref Mohammed's - was verified by UN investigators. Muawiya's remains unseen but reportedly must be the one south of there, right across from the hospital. These bodies may have been removed, since SANA didn't show them. Why them and not the others? Were Aref's family, the ones allegedly related to Meshlab Al-Sayed, left for the government to find, verify, and report to their people? Or were the rebel attackers just forced to retreat before they arranged the removal? There was also a negotiated hand-over of these bodies back to the rebels, a hand-over mediated by the United Nations monitors. (citation and details needed) Who exactly their families are and what they wished is unclear, but after the hand-over, they were probably interred with the others in the opposition's mass grave. The ten reported Alawite victims in Al-Shumeriyeh, "Mohammad Abdul-Nabi Abdullah, his wife and six sons in addition to the citizen Rateb al-Oulo along with his son" were, unlike the Abdul Razaqs, identified in the first SANA report. Unlike the northern Sayeds, they were apparently not left behind to be found. SANA knew about them because of a local's report, and no images are shown from there (the other stills with the report are from a rebel Youtube video, with the bodies being brought into the mosque late on the 25th - see here or here). As mentioned above, there is a case to be made that the ten bodies seen in one unspecified home were these two families. With five larger bodies completely covered, and five children as old as around 13 uncovered at their feet. If one of the Abdullah family's children, and Mr. Al-Oulo's son, were old enough to be considered adults, that would explain this array. There is also the unusual aspect of this scene of there being no known video footage from it, only a set number of still images. If so, however, no one to our knowledge has made much noise about these particular images showing the Al-Shumeiyeh victims. If there were such victims, they might have been among these seen at the mosque, but if so, with new identities that don't line up; nothing apparently matching the identities stated by SANA seems to appear on the DCHRS victims list. ↑ Syrian new parliament holds 1st session to elect office membersCNTV, May 24, 2012. 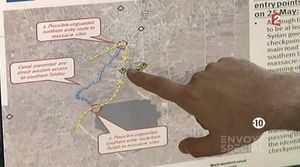 ↑ 17.0 17.1 "Syria: UN Inquiry Should Investigate Houla Killings" Human Rights Watch, May 27, 2012. This page was last edited on 30 December 2014, at 11:14.